Check out the spook-tacular Halloween decor Target has this year!! They barely got them stocked on the shelves before I snatched them up. I love the non traditional turquoise mixed in this color scheme. The table cloth is a black faux fur fabric from JoAnns. I sprinkled googlie eyes in different sizes around the table. 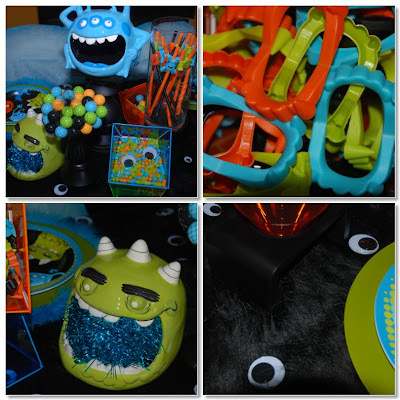 The paper plates, monster jars, flex straws and monster teeth all came from Target. I put a blue marabou boa around the charger plates and filled containers with candy in coordinating colors. Now get to Target and gobble up your own monster bash. 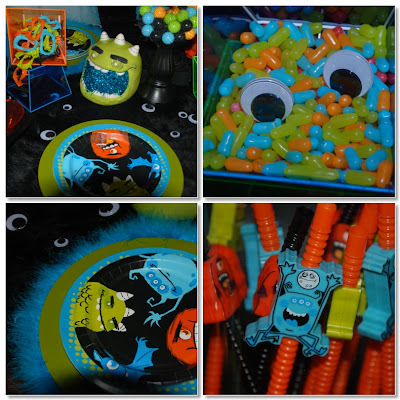 This entry was posted in Halloween party, Monster Theme Party on September 7, 2009 by Setting the Mood.